If you are not meat-savvy like Ron Swanson, you are probably asking a second question – why this question? Well, you are not alone, and most people will not tell you what makes the distinction between these two types of meat. And to say that there are no variances would be a big lie because those who know better would never pass such an idea. So, what really is the difference between the New York Strip and the Rib Eye meats? Somebody would be fast to ask, “Is meat, not just meat? Why would we categorize it further apart from the usual categorizations such as beef, mutton, pork, etc. ?” The truth is, the New York Strip and Rib Eye are not one and the same. This is regardless of how much people, including retailers, interchange them and use each in place of the other. If you have a burning desire to know which is which between them, read through to the end of the post. It seeks to shed some more light and draw insights on the key characteristics of each meat. However, the post does not give personal opinions on what is best for the consumer. What is the New York Strip? The New York Strip, called so because of its association with the city of New York is widely referred to as Strip Steak. It is a cut of beef steak cut from the short loin of a cow. The steak consists of a muscle that performs little work. The muscle is called the longissimus and the fact that it performs fewer functions makes the meat particularly tender. When the strip is still attached to the bone and still has a piece of tenderloin, it becomes a Porterhouse steak or a T-bone steak. The difference between the two is that the porterhouse steak has a larger portion of the tenderloin. The Ribeye, also called Rib Eye is a beef steak that is cut from the rib section of a cow. The rib section from where it is cut spans between ribs six through twelve. Mostly, the Rib Eye steaks are composed of the longissimus dorsi muscle. However, they also contain the spinalis and complexus muscles. Rib Eye also has some variants. If the beef steak is sliced from the rib primal of a beef animal and has a rib bone still attached, it is referred to as a rib steak. 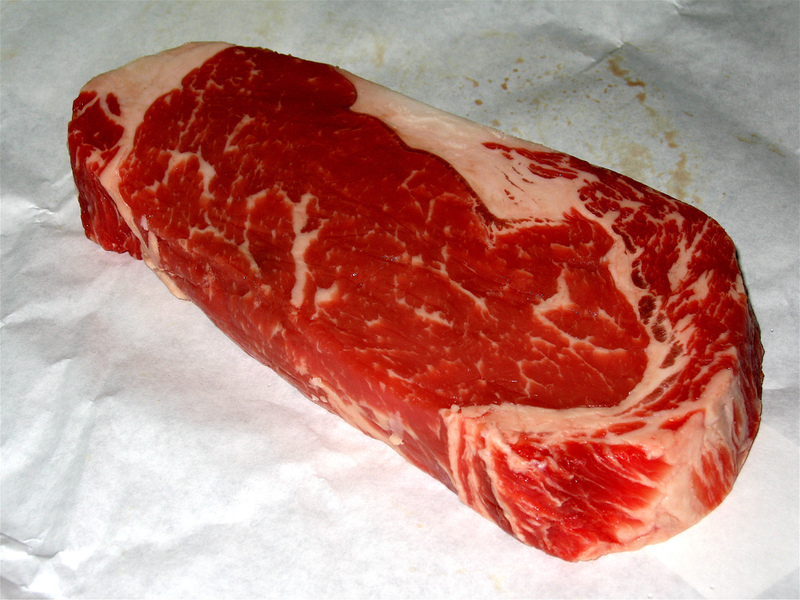 In the US, if the rib steak has the bone removed, it is then referred to as an eye steak or Spencer steak. The New York Strip is cut off from the short loin of a cow while the Rib Eye is a steak cut from the rib section of a cow. Even though the two steaks come from areas that perform little functions, the tenderness is a differentiating factor. While the New York Strip is a bit hardy, the Rib Eye enjoys more tenderness. The Rib Eye has significantly more fat content while the New York Strip has less fat content. Depending on the country, state, and localities, the two steaks have different name variants. The New York Strip is also called the Ambassador Steak, Kansas City Steak, and Boneless Club Steak. It is also referred to as contre-filet (French), strip loin (Canada), sirloin (UK). The Rib Eye, on the other hand, is also called Delmonico steak, beauty steak, Spencer steak, and entrecote (French). 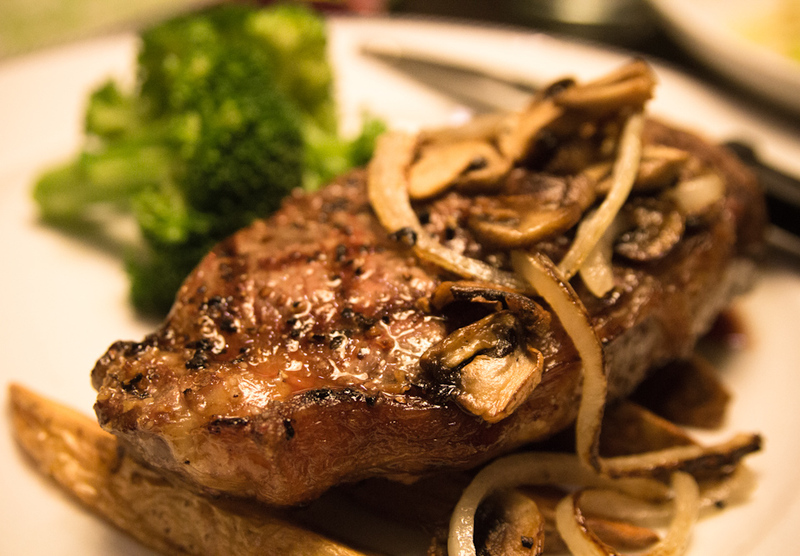 The New York Strip is available boneless while the Rib Eye is available as a bone-in or bones. The New York Strip and Ribeye (also referred to as Rib Eye) are both beef steaks. They enjoy a great deal of following with almost equal fan bases. Those who love the strip have their reasons while those who are into the Rib Eye also have their explanations despite the two being beef. Regardless, they have their respective characteristics that make them different from each other. These traits include the source on the body of the animal, the nutritional values, fat contents, and the texture. Also, they have different name variants based on the country or state in question. Sarah Brown. "Difference Between New York Strip and Ribeye." DifferenceBetween.net. 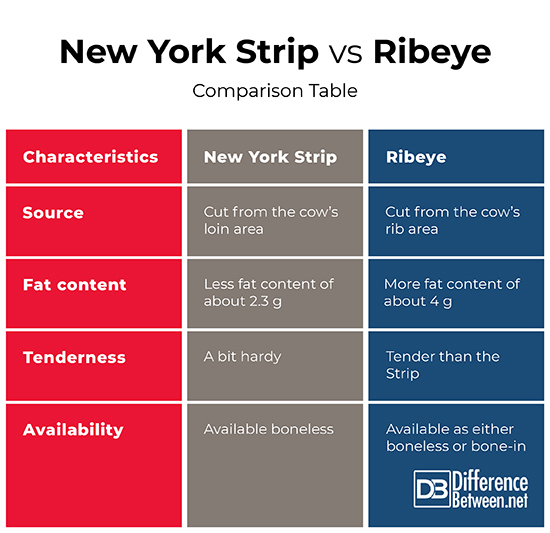 January 29, 2019 < http://www.differencebetween.net/object/comparisons-of-food-items/difference-between-new-york-strip-and-ribeye/ >. "New York Strip Vs Ribeye: Two Premium Steaks With One Big Difference". Meat Smoking For Beginners, 2018, https://www.bbqdryrubs.com/new-york-strip-vs-ribeye/. Accessed 19 Dec 2018. Eats, Serious. "Four Expensive Steak Cuts To Know". Seriouseats.Com, 2018, https://www.seriouseats.com/2011/03/the-four-high-end-steaks-you-should-know-ribeye-strip-tenderloin-t-bone.html. Accessed 19 Dec 2018.